Photo courtesy The New York Botanical Garden. Much like the rest of New York City, The New York Botanical Garden did not escape the devastation of Hurricane Sandy in October 2012. The 50-acre Thain Family Forest, which is home to over 30,000 trees, was the Garden’s biggest victim from this natural disaster. Sandy knocked down or damaged over 550 trees across the grounds, including over 100 trees in a forest which has stood since the last Ice Age. 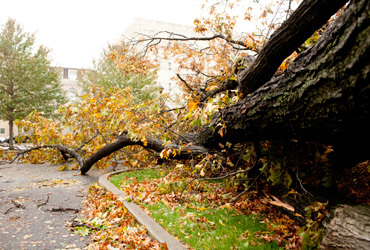 In terms of the number of trees destroyed, Sandy was the most devastating storm in the Garden’s 120-year history. For those who care for the Forest, the destruction of Sandy was particularly difficult. “I must say, walking in the next day and seeing, particularly in the Forest, the level of devastation was heartbreaking. These are trees that I knew sort of individually. And I’m not going to say I took them for granted, but I will say that I didn’t celebrate them enough while they were still standing,” said Todd Forrest, Arthur Ross Vice President for Horticulture and Living Collections of the Garden. The New York Botanical Garden’s Todd Forrest, VP of Horticulture & Living Collections, and Jessica Schuler, Manager of Thain Family Forest, discuss the impact of Hurricane Sandy on the Garden. The trees also hold records of weather within their trunks from their entire lifespan. By studying the fallen trees from Sandy, scientists have been able to document weather patterns and climate change by analyzing tree growth. “That will certainly help people better understand the way climate has changed over time,” said Forrest. In fact, the rings of the trees not only reveal weather patterns and age, but also can even help determine the future of the forest and its many species. Despite the damaging effects of the storm, the future looks bright for the Thain Family Forest. With new research opportunities and a better understanding of its beloved trees, the Forest is prepared for growth, change, and a new generation of visitors. In this segment from MetroFocus, host Rafael Pi Roman sits down with author Todd Forrest and photographer Larry Lederman to discuss their collaboration on “Magnificent Trees,” a book of photos and essays on the trees of The New York Botanicial Garden. Video courtesy of MetroFocus.